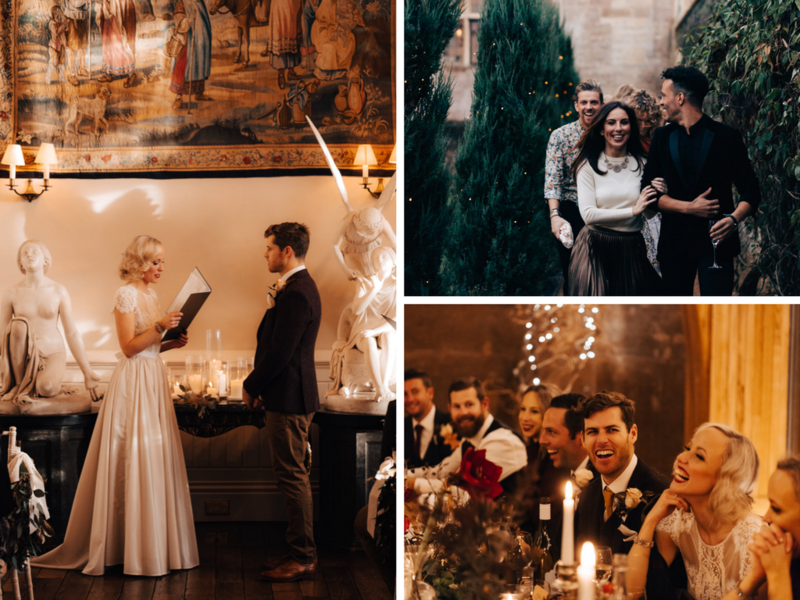 Flora and Ben's wedding is a real winter warmer, celebrating all that is great and good about our wonderful British seasons in the gorgeous historic building of Elmore Court. Enveloping their whole day in rich tones of red and green, in keeping with the season and surroundings, the wedding has a real theatrical feel to it with the richness of colour bringing the whole venue to life. With the day being a real celebration of true, limitless love after a long-distance relationship between the UK and New Zealand, the couple tied the knot on the 11th of December 2016 with their family and friends from all over the world at their side. The amount of fun and personality present at this wedding is infectious and truly captivating - plus we guarantee by the time you've finished reading this, you'll be pining after a winter wedding, much like the Wedding Planner team now are! Enjoy. Flora and Ben first met five years ago during a lovely sunday spent in the pub. It was the day after St Paddy's day celebrations, so it was fair to say the atmosphere was still pretty raucuous. Ben was over from New Zealand on a two year working visa with just three months left and Flora was enjoying one of her few days off from her hectic schedule in the West End Musical 'Singing in the Rain'. The couple started to date and with months flying by so quickly - it was all of a sudden sadly time for Ben to head back to New Zealand. After the show run had finished, Flora joined Ben in New Zealand where they did a few months travelling, but the couple were set to go long distance again with Ben's job taking him to Abu Dhabi and Flora returning to England. Thankfully Ben finally managed to secure a job in London permanently and the couple have been living together ever since! On a return visit to New Zealand for Ben's brother's wedding in March 2015, the couple went to the Coromandel for a few nights - a village the couple fell in love with on a visit back in 2013. Ben had initially wanted to propose at the end of a headland overlooking the beach but Flora had actually twisted her ankle badly at the wedding and was unable to walk! So after a long sunny day spent at the beach, the couple started to head home and as Ben pulled an injured Flora to her feet, he promptly dropped to his knee! Flora was completely surprised and speechless, but she managed to get out a yes! After the shock had subsided, they headed back to the cottage they were staying in to enjoy a bottle of champers Ben had managed to sneak in especially! The couple chose to get married at the stunning Elmore Court in Gloucestershire, hosting the whole wedding there. They didn't need to have a traditional ceremony as they had been legally married in the Ealing Town Hall Registry Office, so it meant Flora's bridesman and her brother could conduct the ceremony in their own unique and funny style. They also had the fotunate opportunity to be entertained by Flora's talented friends who sang beautifully, along with both their mums who read some personally chosen readings. Flo actually found the venue of Elmore Court during a 'hypothetical wedding planning' day with her sister, before Ben had even proposed! The couple were after a historical and typically English venue that would wow their guests, especially the kiwi's who had travelled all that way - and Elmore Court was just that. The venue also meant the couple could enjoy their ceremony and reception in two different spaces, with it's impressive Great Hall and purpose-built Gillyflower being their chosen options. Both Flora and Ben are keen dancers (Flora professionally, Ben - only at parties!) so they wanted somewhere with a great sound set up and dancefloor and the space really catered to that. The couple didn't want a blowout wedding so they felt Elmore Court was the perfect price and the support they received from the team on the lead up to and on the day was priceless - especially with Flora performing on the West End right up until the day before the wedding. By choosing to have a Winter wedding, it meant the couple could go to town with warm textures and colours. They went for tweed, velvet, wool and lace for the bridal party outfits along with rich green foliage mixed with burgundy and mustard coloured flowers for the bouquets and table decorations. They didn't necessarily have a particular theme or style, they just simply embraced the traditional and earthy tones of the venue and it's surroundings. As many brides do, Flora followed a number of bridal Instagrams to find dress inspiration and Katya Katya Shehurina's dress designs particularly caught her interest, with her falling in love with the 'Rosa' dress in particular. After enquiring about the price and learning that unfortunately, it was well out of her budget she discovered they were in fact doing a sample sale. As if by magic, it turned out the 'Rosa' dress in question was set to be sold at half it's original price so Flo instantly booked a visit to their Soho shop the following day. Taking her closest friends with her and sending photos to the bridesmaids who couldn't make it, it was a unanimous 'yes' from all and so she purchased it right there and then! All the guests mentioned how beautiful the dress was, with many noting it was very 'Flo'! "Don't worry or spend too much time on the small things. You won't notice them on the day! Get a videographer if you can afford one or have something / one of the guests organised to film bits of the day. I dropped the ball on this and we've regretted not having it properly filmed. Finally, have fun!!! At every point leading up to the big day, and also on the day itself, try to make the task enjoyable and avoid anything stressful. If a supplier or contact is causing you anxiety, tell them...or break ties...you don't need it!" Ben: seeing Flo walking down the aisle and the whole ceremony was magical. Flo: Watching Ben perform his speech with confidence and care...it was thoughtful and funny, and definitely brought a tear or two to my eye! !